Prime Minister Binyamin Netanyahu has weighed in on the controversial issue of punishment for hareidi men who do not enlist in the IDF. The Prime Minister declared that he is against sending yeshiva students to jail – putting him on the side of the Jewish Home party, which favors non-criminal sanctions, and against the position of Yair Lapid's Yesh Atid. “I won’t be a part of sending Jews to jail for studying Torah,” Netanyahu declared. His statement came in response to a question from Gershon Mesika, head of the Samaria Regional Council, at a Likud party event. The Shaked Committee, which is tasked with drafting a law on hareidi enlistment, has seen its work delayed by debates over the question of punishment. The Yesh Atid party strongly favors criminal sanctions. 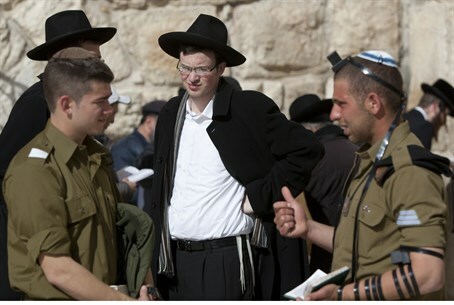 Hareidi leaders have expressed strong opposition to criminal sanctions for yeshiva students, and pro-enlistment leaders have warned that strong sanctions could create a backlash that would mean fewer hareidi men in the army, not more. “Hareidi men who are not learning in yeshiva should serve in the IDF,” Deri said. However, he said, those who prefer to contribute to the state by learning Torah should be allowed to do so. Until recently, the now-expired Tal Law allowed all full-time Torah students to gain an exemption from national service. But criticism of that arrangement as both unfair and unsustainable (particularly given the hareidi community's rapid growth as the result of a high birth rate) culminated in the current proposals, often referred to as the "Sharing of the Burden" bill. Part of the issue at hand is also the high unemployment rate among hareidi men, most of whom opt for for full-time Torah study instead of seeking employment, or even basic academic or vocational qualifications. Those who at a later date opt to seek employment find themselves at a distinct disadvantage to other job candidates, and all but shut out of the job market. Proponents of the upcoming enlistment law say that avoiding the draft perpetuates a separation between hareidim and the rest of Israeli society, which makes penetrating the work market for more difficult in later years. Naftali Bennett for example has argued that encouraging hareidi employment is by far the most important goal of the new legislation. MK Omer Bar-Lev (Labor) has proposed a compromise plan that would create a longer grace period during which sanctions would not be enforced.